I try not to be the martyr VW owner that some VW owners like to be. Some like to think that owning a car that never runs at 100% is somehow a meaningful endeavor like shopping local or voting. I want my VWs to run, and am unashamed when I need to enlist the help of mechanics who have been working on VWs for 30 or 40 years. 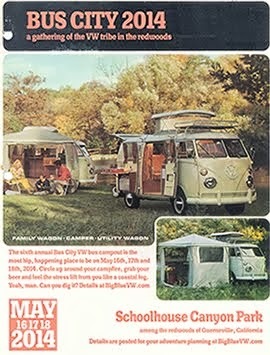 That said, let this post be a warning to the "I wish I had an old VW van"-types out there. VW owning is indeed a meaningful endeavor akin to voting, shopping local and telling "the man" where to stick it. But it isn't always easy and sometimes it is just plain damn hard. So you can't drive your bus home so you bum a ride home that night and for like the next 2 weeks because your other VW (VW 1) had an engine go out and that was sitting until you mustered the guts to have it towed and finally cash in on the $240 you've paid to AAA the last 3 years. So you do that and they charge you $2300 for the work and you get a working VW - but your bus is still sitting where you parked it at work! FINE! I'll move it to the back. I don't need this damn job anyway! So your bus sits another month while you track down the info on the problem. First, you head to the local VW shop and the guy not only tells you, literally, "You are screwed", but then proceeds to question your honesty when you tell him what happened. He really says, "Something in your story doesn't add up." And how in 40 years of being in VWs he's never heard of such a problem. You decide at that moment (much like that time at UHaul) this guy will never, ever get a single goddamn cent from you. You show him a photo on your phone of the damage, then he believes you. You milk him for all the info you can acting like you'll be back. You get details - your beam is crap, but it can be taken out fairly easily and a new one can be bolted back in - then walk out the doors thinking you'll never be back in that shop again. Ever. 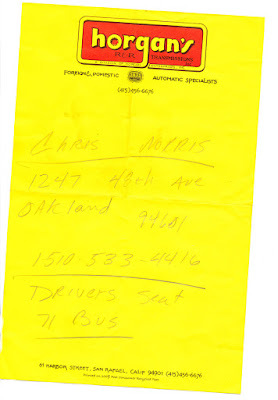 Then, you call your old friend/mechanic and say, "I need a new beam for my bus. You have one?" He does. But he wants it for another project. You then stop by another place where a guy has like 6 buses out in his yard. You've always wanted to stop by and now you have a reason. He's cool. And he has one but he too wants it for another project. You shake hands, saying you'll swing by again and say hi sometime soon. He wishes you luck. You search the internet and post about your troubles. Everyone who has what you need is in Maine or Florida or Paw Paw. No one in your area - an area so populated with VWs it makes other VW owners sick - seems to know where one is. So you place a "wanted" ad. And people respond. But no one knows what year bus their beam came off. No matter! Mechanics (multiple, now) have told you they are all the same. You borrow (in shame) your wife's car to buy a beam from a guy an hour away for $75. Finally, you are rolling! You don't want to tow the bus home and do it yourself because your 3rd (yes 3rd!) VW is all apart and between that and the engine that was removed from VW 1 - you have enough projects to last until your 1-year-old son is of legal drinking age. So you take the beam (after 3 months, this plan is working perfectly) and throw it in the bus to get it towed to the shop who will swap the beam. You call AAA and cash in again (2nd tow in 2 months) and then go to get the bus ready to go on the tow truck (between meetings and phone calls at work). You use VW 1 (glad that it is now a 12 volt system) and charge the battery to start your VW bus after 20 minutes. Swell! But it won't stay running so you have to drive around the parking lot at work for 20 minutes "charging the battery" until you back it into an easy spot for the tow truck to get to, and turn it off and, DAMNIT - it is dead again. No big deal. AAA comes once. Looks at the bus. Then leaves. Then comes back a few hours later to tow it. You take pictures as it goes for your stupid blog. So you are like, whew!, that's done. In a week or so I will have my cool VW bus back to carry my surfboard. 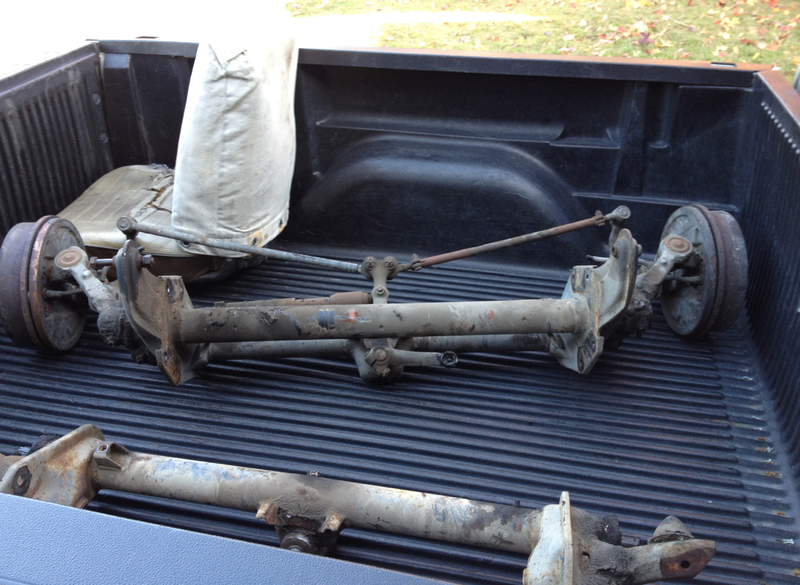 "Hey Brett wrong front axle, I cant find your phone number"
Looks like the front axle is from a 70 bus, which won’t work, all axles from 1955-1969 will work, but of course ball joints started in 68, soooooooo, we need a 68-69 front end, hopefully the guy you got this one from can exchange it, if not maybe we can put from a 1949 hudson tera plane, I hear they are close. There is no exchange! You paid $75 bucks to a dude off Craigslist. "Damn! I just let my Hudson parts car go to some nice fellow rebuilding a Camaro. Keep the one you have for the next poor schmuck. I'm on the hunt for a 68 or 69. I'll get back to you as soon as I can locate one. Thanks for taking in the beast. I know Blue's been neglected of late and shows it." 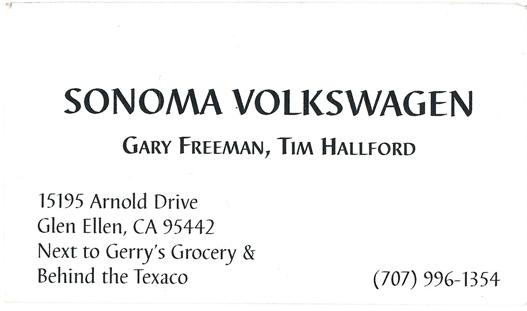 So you call Sonoma Volks. Yeah - he's got it - but it's an entire axle. You make plans to meet. 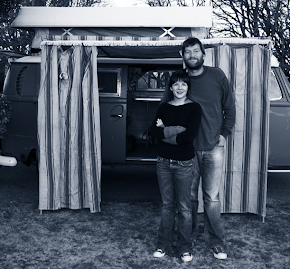 But you need a truck (because normally you carry big things in your now at-the-shop-not-moving VW bus). You borrow a pickup (what a dumb name for a truck) truck from work and drive it home on a Thursday night. Friday, you go pick up the beam 30 minutes away. He swears it's a '68 beam. You ask the difference and he says something about a mount on the beam or something related to brakes. So you pay him $275 plus tax for the entire front axle and the 2 of you horse it into the borrowed pickup. You drive it to your mechanic (an hour away) to drop off the beam. You bribe your mechanic with homemade wine, a CD and another, less legal, gift. He digs it, but tells you you still have the wrong beam. You now have 2 wrong beams. Oh, and the broken original beam. Solid work, man! You drive back home, watch your one-year-old for a while so your wife, who has had about as much of this as she is going to take, can actually do something non-VW related in the real world. When she's back, you and the pickup and the bum beam head back to Sonoma to drop it off and get your money back. You call the 2nd joint your mechanic mentioned. Yeah - he's got it. You open tomorrow (Saturday)? Yeah. Monday? No. Saturday it is (because Sunday is Christmas!). You and the pickup truck you don't own drive to the worst possible 'hood in Oakland to a generic, unnamed building, guarded by a dog. This is serious Compton-looking stuff. Only Compton is a joke compared to Oakland. But the shop is closed (it's Christmas Eve!). Monday. You are able to shake the shackles of parenthood around noon. You and the truck and the (hopefully correct) beam and the seat stop at Wendy's on your way. You find it disagreeable. You drive the 30 minutes to the shop. Your mechanic is happy with the beam you have brought. And the seat. You chat, discuss other projects. Shake hands. 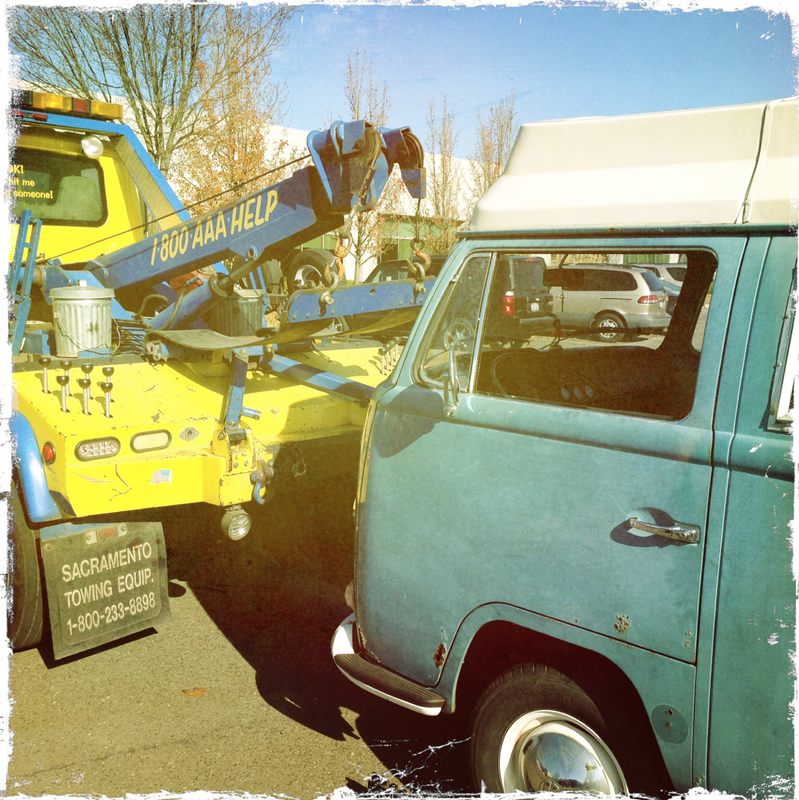 Your cool VW bus will be back on the road soon! But, you have to return the truck. You wait until your son is asleep and your wife is too tired to care and you sneak out in the truck. You drive the 45 minutes to work, drop off the truck, hop in VW 1 and drive the 45 minutes back. You are tired and fall asleep upon arrival home. And that, dear friends, is what it can be like to own a VW bus. Still want one? Then get one. Because when that bus is back on the road and you have tunes blasting and you are pulling up miles seeing new things, it is a ton of fun. I'm excited to see Big Blue back on the road (of course, by "road" I mean pictures of roads...on the internet). Excellent post Brett. I could feel your frustration bleeding thru your story. Another genuine VW tale that should be mandatory reading for all the wanna be's out there. Take heed. Bus ownership requires the patience of Job; the stamina of a horse; and when the going gets tough....cough up a few more shekels. But at the end of the day.......yes...it is an endeavour worth furthering. That's exactly how it goes! I know have a policy of giving every system on a new VW a thorough inspection, which usually leads to a total replacement immediately after the purchase. I also refuse to let anyone else perform any work on them. That seems courageous until you consider how simple they can be to fix. As a past US President used to say, "I Feel your pain!" Great story and shows how addicted we get to these air breathing, rear engined, fossil fuel burning rides. After all that, you will still love that bus! Thanks for the laugh and reality of owning one of these "cute" vehicles. Brett, as others have said, yes, this sums it up pretty well. I'm working on rebuilding the same type 4 for my 75 bus for the third time in the last year for various reasons. Did I mention how type 4 parts are just falling off the trees? 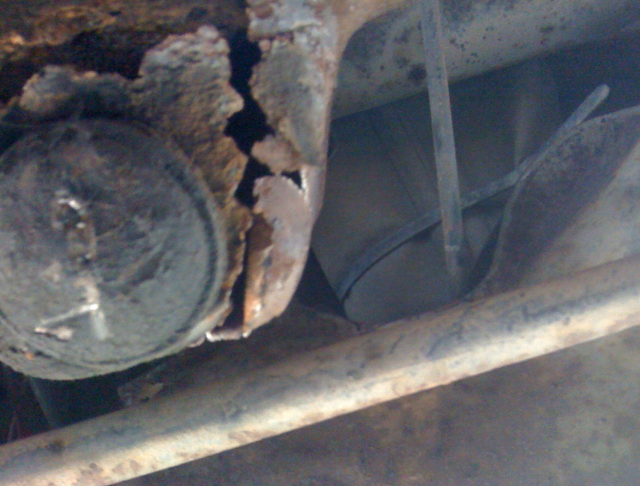 I haven't mentioned the woes of my Beetle. At least my 71 camper is running great...for now. Keep the faith and it'll all be worth it when you're crusing in Big Blue once more. Indeed - Big Blue is back on the road and pulling out of town and getting him into fourth gear was a great feeling. Good to be back in the saddle! If I can't fix it, I am not shy about getting help. It has to run. I get plenty of help to keep it on the road, does no good just sitting around.